IGH's Science Communication Officer Nicola Frost on 'educating, engaging and entertaining' at our 2014 Christmas Science Lecture for primary schools. Early last year I was chatting to a scientist from our Institute who had an idea he'd been bouncing around his head for a while, but not yet made happen. The idea was simple; a fun, interactive Christmas lecture aimed at children to engage them in the science of germs and infectious disease. Over a coffee, we threw around some ideas and a plan was formed! 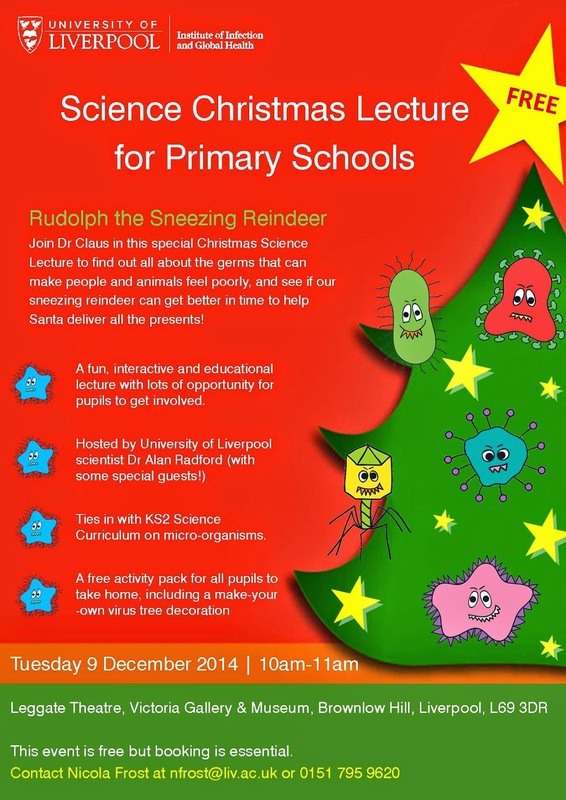 So back in December 2013 Dr Alan Radford hosted his first ‘Rudolph the Sneezing Reindeer’ lecture. It was such a success that we decided to run it again this year specifically for primary schools. The University of Liverpool's Victoria Gallery and Museum offers great accessibility and is impressively grand and historic so was perfect for our venue. The Leggate Lecture Theatre, where we held the lecture, definitely has the wow factor and is a great setting for educational events. So with a venue and date of Tuesday 9 December confirmed, we pulled together a team of seven volunteers from across the Institute, including PhD students, researchers and professional services staff interested in developing their public engagement skills, to help deliver the event. Dr Radford also persuaded his colleague Dr Phil Jones to play the part of Santa and PhD student Maria Afonso to play Rudolph our sneezing reindeer! It’s quite a tough task ensuring activities for schools are appropriately educational, engaging and entertaining so a lot of time was spend working on the lecture content and the festive script by the team, and tying it in with the Key Stage 2 Science Curriculum on micro-organisms. At the same time, the presenting team also had to lose any inhibitions and be prepared to have a bit of fun and entertain the audience - a bit different to the normal science day jobs they're used to! Making sure that our our programme of outreach events is properly funded is an important part of my job, and I work with scientists to help them secure public engagement grants from various societies and organisations. Even so, a small amount of money usually needs go a long way so you need to be a bit creative with your ideas. In this case we actually managed to borrow a few key items, including a reindeer fancy dress costume and a life-sized anatomical model of a torso! Our target audience for this event was primary school pupils, so I worked with the University’s Educational Opportunities team and MerseySTEM who helped promote the event to local schools. I also contacted local Home Education Groups and schools and teachers who we have previously worked with. The lecture was free for schools and we had a great response and managed to fill up the places quite quickly! Messy, fun and extremely interactive! After a lot of hard work from everyone involved, the event went really well, with highlights including pupils unravelling 40 toilet rolls at once to help them visualise the size of viruses (messy but fun! ), a game of antibody ‘tag’ and a special ‘infectious’ version of Jingle Bells performed by our guitar-wielding Santa! We had over 130 pupils, teachers, home-schooled children and their guardians attend the lecture which we were really pleased with. The formal feedback we received has also been really positive and we will use this to evaluate the success of the event and decide how we can make our offer even better for next year. Be clear on your aims and objectives – what exactly to you want to achieve and why? How will you measure whether you’ve been successful? Make your budget work as hard as possible for you – try and borrow items that you are unlikely to use again in the future, and shop around for good deals on consumable items. 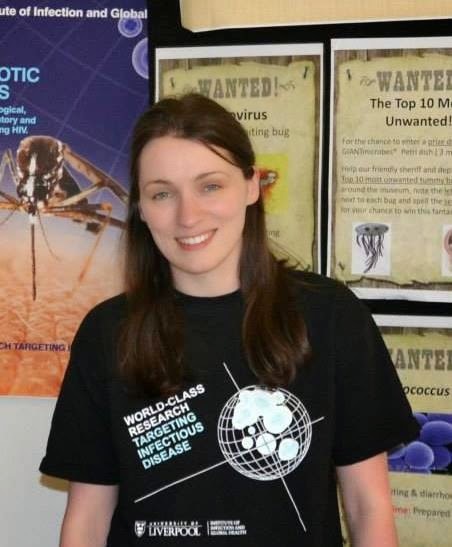 Nicola Frost is the Science Communication and Public Engagement Officer for the Institute of Infection and Global Health. Find out more about the Institute's public engagement programme on our website. The Institute of Infection and Global Health. Powered by Blogger. The University of Liverpool's Institute of Infection and Global Health (IGH) is an international centre of research excellence dedicated to improving the health and well-being of humans and animals. Follow our blog for monthly updates and opinions written by staff and students, covering an array of topics, and get a personal insight into how we are tackling key infectious diseases across the globe. The views expressed by the authors and those providing comments on this blog are theirs alone, and do not necessarily reflect the views of The University of Liverpool Institute of Infection and Global Health or any employee thereof.